As one of the main contributors to job creation and innovation, entrepreneurial activities are vital for a country like South Africa where every fourth person is without a job. Validating and realising a business idea has become easier in the course of digitalisation. The internet offers various digital tools such as reaching out to potential customers (social media), designing promotional material (Canva & Powtoon) or raising capital (crowdfunding) just to name a few. However, being aware of the opportunities presented through digital devices and knowing how to use available tools is essential. In her Masterˈs thesis, Mareike Hinrichs (University of Flensburg) would therefore like to focus on digital tools that can empower aspiring entrepreneurs in their early activities of starting a business. Through YEEES, she conducted research in South Africa from July to September 2018. Her case study involved two business incubators in Port Elizabeth, where she conducted focus group discussions with aspiring entrepreneurs. These insights helped her to identify barriers related to the use of digital tools, and to discover the main challenges these incubatees are facing in the early activities of the start-up process. In the beginning of September, Mareike facilitated a one-day Design Thinking Workshop on her research topic with 18 participants at The Hope Factory. She invited stakeholders who are actively contributing to the local start-up ecosystem, so that aspiring entrepreneurs could connect and engage with them during and after the workshop. Thus, the participants developed ideas that suit the needs of aspiring entrepreneurs recruited by business incubators in Nelson Mandela Bay. 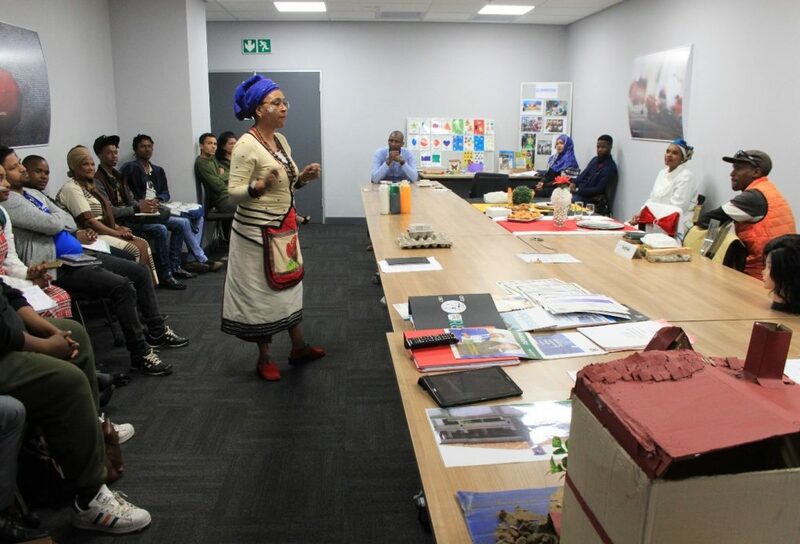 In addition, she did small field trips that allowed her to explore the infrastructure and programmes offered not only by the Nelson Mandela University, but also at business hubs and incubators situated in the city of Port Elizabeth. All of this was possible through her network that enabled her to set up meetings with entrepreneurs, business lecturers, coaches and innovators. Moreover, being invited to pitch events, Mareike managed to make further observations, asked questions, and got to know individual stories and dreams. In 2017, Mareike assisted the Computing Sciences Department at NMU in establishing the Young African Women in Computing (YAWiC) initiative. During her research stay this year, she was again able to see 30 female learners attending the two-day workshop, to be taught how to use computers and learn how to code. Another initiative she got introduced to during her stay is called Young Entrepreneurs (YE). Their programmes teach children from the ages 7-18 vital entrepreneurial skills, financial literacy, employability and workplace readiness skills that help them start and grow their own micro-enterprises in a fun and experiential way.